Using a knife, chop the ends off the zucchinis. Cut the zucchinis in half. 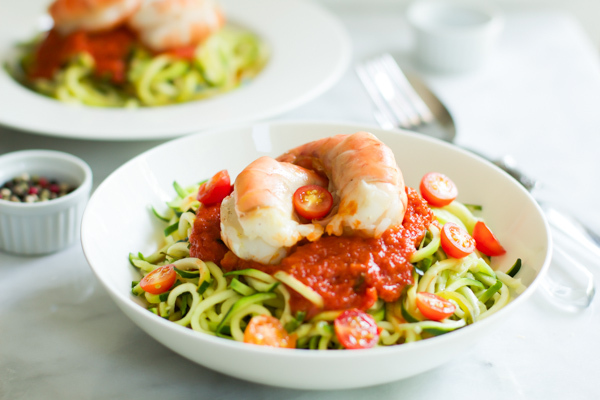 Using a spiralizer fitted with a shredder blade C, secure and spiralize the zucchini. Use kitchen scissors to trim noodles as the noodles come out. If you don’t trim, your noodles will be very long. I prefer to trim because they’re easier to eat. Set the noodles aside. In a large saucepan heat olive oil over medium-high heat. Add shrimp, salt and pepper. Stir occasionally and cook until pink and set aside. In the same skillet add garlic, onions and red pepper flakes. Cook until onions are gold brown. Add the zucchini noodles and cook, about 3 minutes. If you cook them more than that the zucchinis can be a little soggy. Don’t forget to stir occasionally. 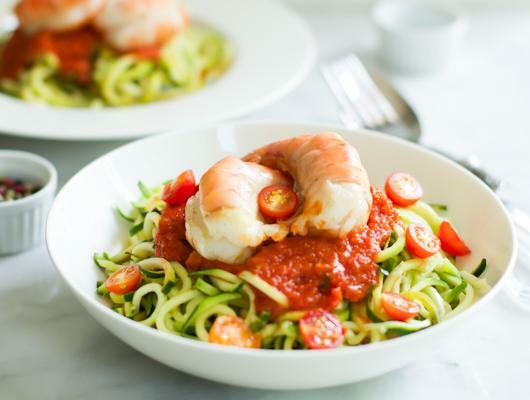 When the zucchini noodles are ready, place them on two plates, top with [url:2]homemade tomato sauce[/url], shrimp and cherry tomatoes! Enjoy your meal!